In response to a Facebook post….. Some of us (Trump Supporters) …. (my head was just moving faster than my fingers) just want to see the country remain AS a country- and have good relations with the rest of the world. Some of us want to see America be a PRODUCING country- not dependent hyper consumers- Some of us want to allow people in our country legally- to avoid dealing with yet more criminality- Some of us want to preserve the rights fought for us (some of us don’t believe in fighting, per se)- and do not want to see America become part of a NEW WORLD ORDER fueled by unGodly energy….. And I personally wish my HRC friends would actually research the issues- and see where the BUSH-CLINTON regime has been leading this country- who fuels them (Check George Soros and his 5 steps to overthrowing a country)…. (Check John Podestas- (HRC Campaign Manager and cohort for 20+ years), personal art collection) What interest does the Rothschild Family have in American Politics to throw in millions of dollars on HRC campaign? Whats the AGENDA there? Who controls our MEDIA? …. Some of us want to see America restored and recovered from the corruption that has been going on … Have a look at who contributes to the Clinton Foundation- Check the ties to Quatar, Saudi Arabia….the list is unbelievably long, the atrocities going on behind the scenes. The only way out from this was Trump- as 1. No one else hit the issues head on 2. no one else was in the mix to choose from. I feel like my friends who I thought had a modicum of personal respect for me- are totally discounting what I have to share- derived from my time spent in discussion with veteran researchers and my own research. Not my personal projection or opinion- the depravity is REAL- and I am a truth warrior- not a fanatic Republican….. Not even registered Republican- the UNBELIEVABLE corruption existing in our government has to be stopped – or we will be at war with the world- causing mass chaos- and ending with US being a completely different animal. What to tell your children? We’ve been duped as a society, dumbed down with artificial chemicals in our food, water,and personal products (Glyphosate found in TAMPONS?) ….. Seriously, its several complex issues- and we as a Country need OUT. Fearful of the “Tone and Example Trump “will set”? 1. Russian President Vladimir Putin is now open to peaceful negotiations with America- as opposed to be preparing for World War 3. That’s a relief! 2. Watch Trump’s acceptance speech- and check the tone. 3. We the People who stand behind Donald Trump will be as patient as possible with the HRC fans who refuse to see these truths- because- the TRUTH ALWAYS COMES OUT! Then, we will be unified in thanking God we had a voice in American Politics. Hope that day comes soon, as we are dividing OURSELVES with this. And please, don’t shoot the messenger! THE BEST “OFF THE GRID” & EMERGENCY SHELTER HOUSING ON EARTH – PERIOD! Imagine having the ability to set up a inpenetrable, strong shelter that will keep you warm, dry and safe after an earthquake, hurricane, tornado or flood. 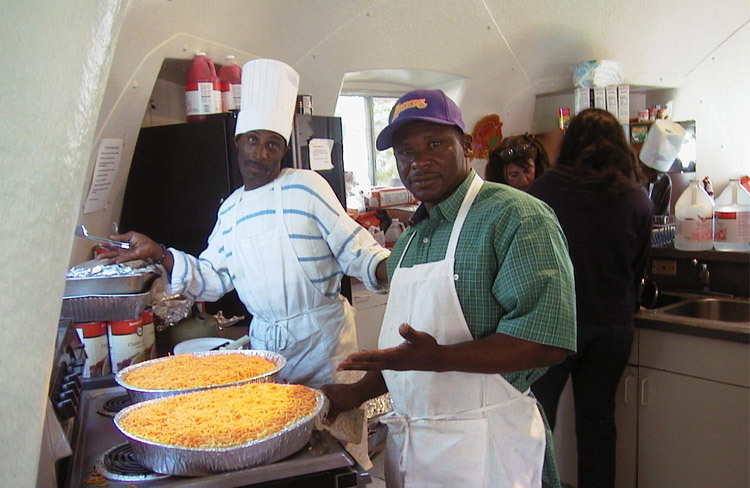 What if you knew that that same shelter would keep you safe IN a hurricane, earthquake and flood? Intrigued? Our shelters are rated to resist CAT 5 hurricane winds and are built to withstand earthquakes as large as an 8.5! The InterShelter™ is a patented, revolutionary portable shelter, made of a high-tech aerospace composite material, or cutting edge HD plastic that has bridged the gap from tents and trailers to traditionally built framed houses. 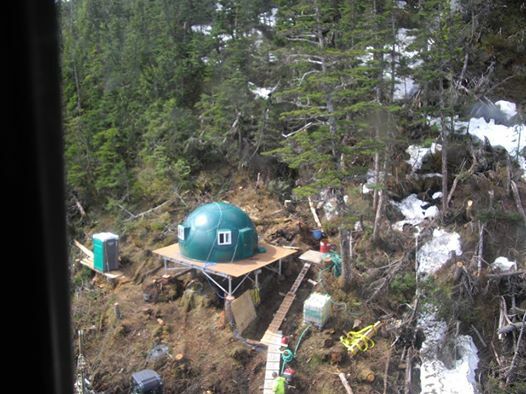 Built to sustain hurricane strength winds or earthquakes and insulated to stay warm in extreme arctic sub-zero degree weather or cool in hot desert climates, these structures can be assembled in just a few hours by three untrained people. 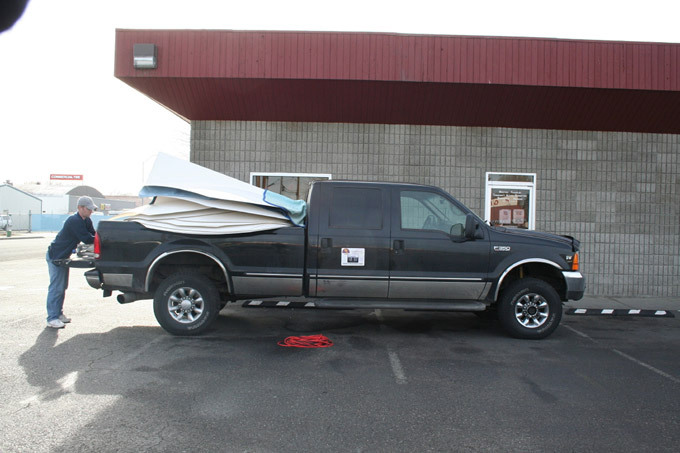 The pieces can fit in the back of a pick up truck can be set up on almost any terrain! 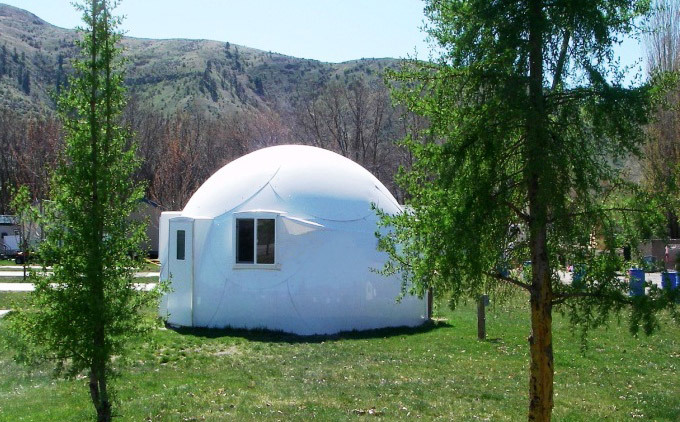 Our Domes can be made to work perfectly using Solar and Wind power to completely Live Off The Grid! Whether you need the Dome for temporary purposes or for longer term, now you have the best of both worlds available to you! Our Solar Dome is totally off the grid, sustainable, energy efficient with a net-zero carbon foot print that “leaves no trace behind” when moved or re-deployed”. UP AS FAST AS A TENT..STRONG AS A BUNKER!!! Okay, so maybe it’s not as fast as a tent, but it’s pretty quick, unless you’re like me and have trouble putting up a tent, then, it might be FASTER! But STRONG AS A BUNKER? REALLY? YES!!!!! We can make your Dome BULLET & even BOMB PROOF! InterShelter announces the ability to turn Domes into bullet and bomb proof bunkers with use of an amazing product called Dragon Shield that the US Military is using! 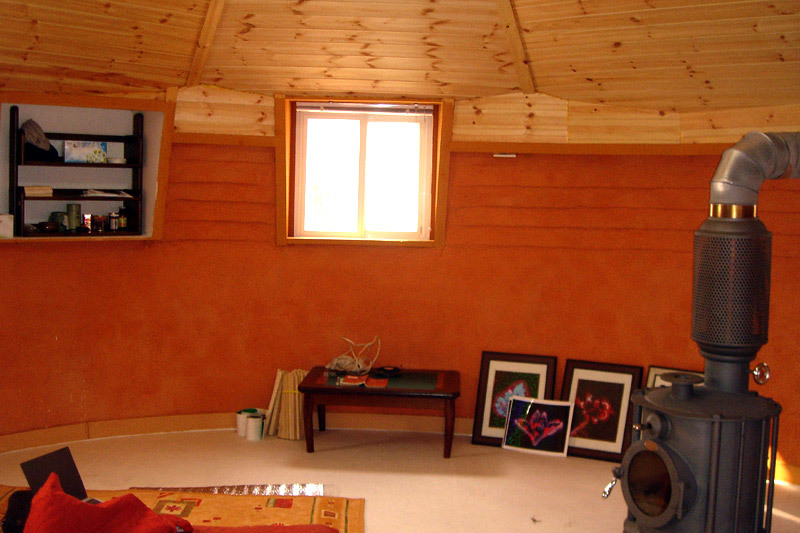 The Best Insulation on Earth? Possibly! From the Desert to the Antarctic! An insulated dome is like a good Coleman® cooler… it will keep cool inside when it is hot out and keep warm inside with just a small heat source when it is cold out! 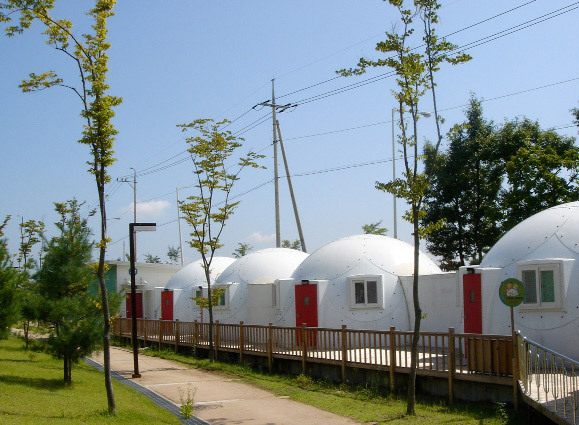 Our insulated domes are good to go in any climate, from desert to Antarctica. 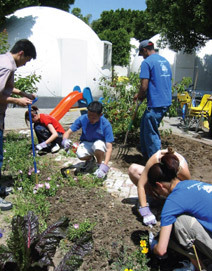 We strive to provide our clients with new and innovative ways to provide shelter in every climate and terrain on earth. After examining countless ways and products to insulate our domes we came in contact with a independently manufactured product called P2000. P2000 is a hybrid rigid-board insulation that in our opinion is decades ahead of the conventional ideas and products used for insulating building structures. P2000 is made with a dense expanded polystyrene (EPS) core and utilizes a high grade reflective finish on one side and a very durable white woven finish on the other. P2000 kits for our Omnisphere come precut to fit in the interior of our structures with no fasteners because of this woven finish; all you have to do is tape the seams. The added benefit once you’ve installed the P2000 kit in your Omnisphere and taped the seams is that you now have a vapor barrier, radiant and convection heat barrier, wind barrier, thermal barrier, bug barrier and a beautifully finished interior for your Omnisphere. Our P2000 insulation kits have been field tested from the areas of Fairbanks, Alaska, at 35 degrees below F to the deserts of the Middle East at 115 degrees F. With the P2000 kits you can warm your Omnisphere to 72 degrees F when it’s 35 below outside with nothing more then a 1,500 watt space heater. The P2000 kits come in thicknesses of 5/8″ and 1″ thick. Whether you are setting up base camp at Mt. Everest or the plains of the Sahara; the insulated Omnisphere will provide you with the luxury comforts of home. ENDLESS USES FOR YOUR NEW DOME! The number of uses for the Dome are endless! If you can think of it, you can do it!!! Here are just a few of the ways the Domes are already being used! 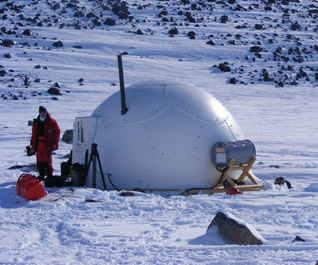 Portable Domes offer several advantages to the hunter(‘s). It permits extended hunting trips with more time devoted to hunting and learning the area and carries very few scents that could detour game in the area. It allows the hunter to stay in or close to game country, where they can spend less time setting up a hunting camp and more time actually hunting in those sites. The Dome allows persons who enjoy the camping/hunting experience to expand the enjoyment of their hunting experience and to share it with a few like-minded people (our domes can sleep up to 6 men comfortably). 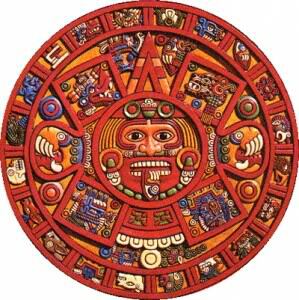 It allows the hunter to “get away from it all” and recreate his or her spirit in the atmosphere of enjoyment. Setting up the dome is easy and cost effective for year after year enjoyment. 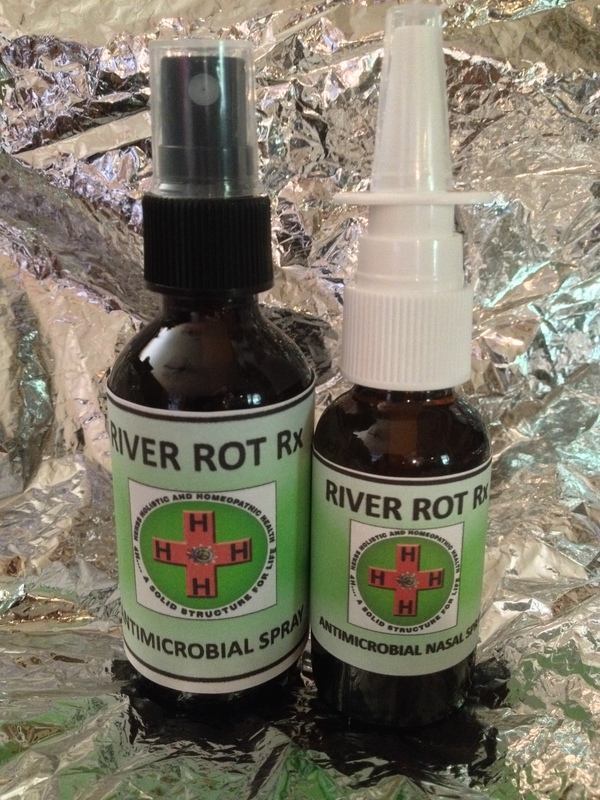 Since our portable domes are made from aerospace plastic it will not discolor or rot. 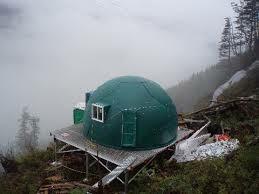 Our dome will serve your needs for more than 20 years and best of all.. You can take it down and move it for any other need you may have such as a storm shelter or a wood shop. 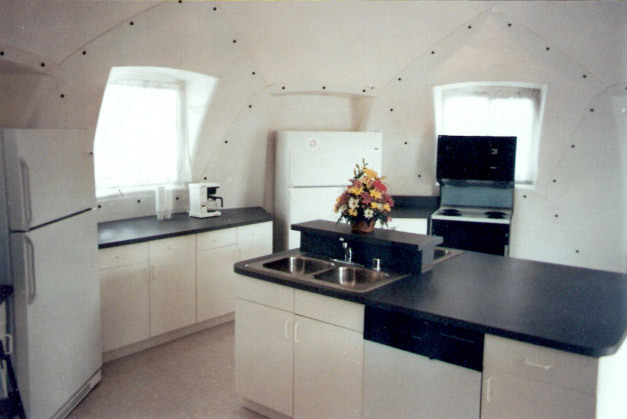 Standard dome features include 2 sliding windows and a metal door. 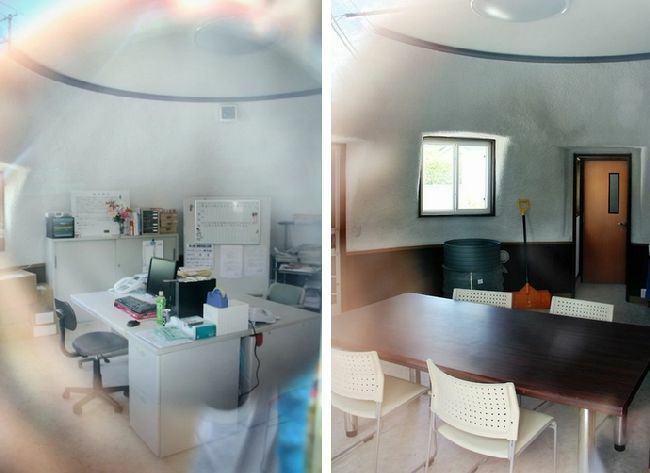 The windows can be configured in about any location alongside the dome for front and rear viewing. 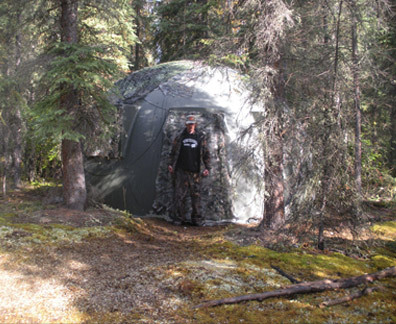 •Camo netting can be placed over the dome shelter to provide invisibility to game. 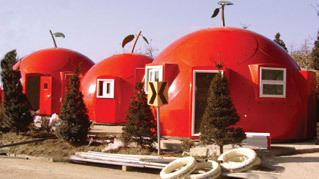 One 20-foot pod can shelter up to 12 men on bunks while a compound of five shelters can accommodate 60 men with a living area between. Customize your new Dome to your heart’s content! 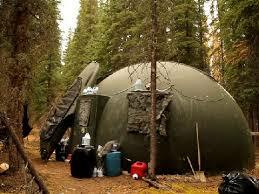 Want your Dome for camping or hunting? 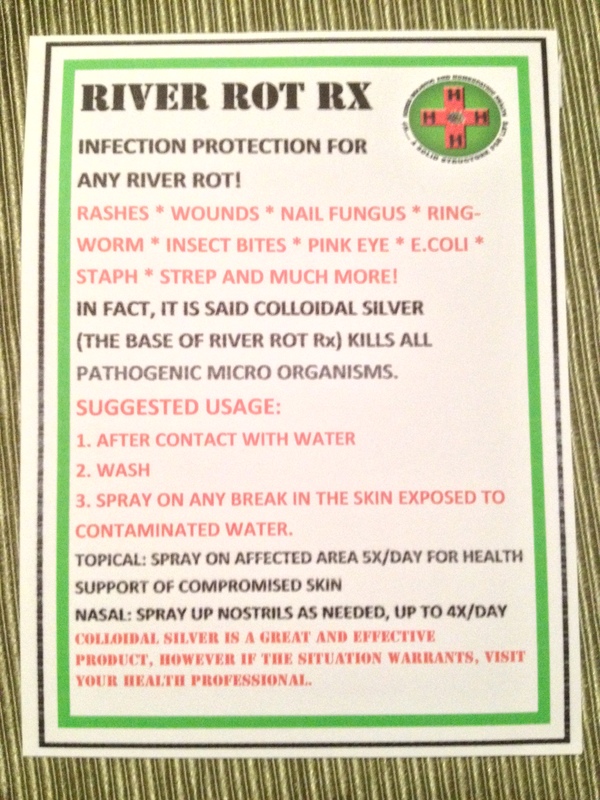 Ask for it in brown or green to camouflage into your surroundings! Want it for a playhouse for your daughter? It can come in pink! There are a myriad of colors it can come in. You can winterize it to withstand below zero temperatures or add a solar package to keep it cool in the most extreme of desert heats. Add walls, a kitchen, beds, windows, office equipment, storage racks, the possibilities are endless! 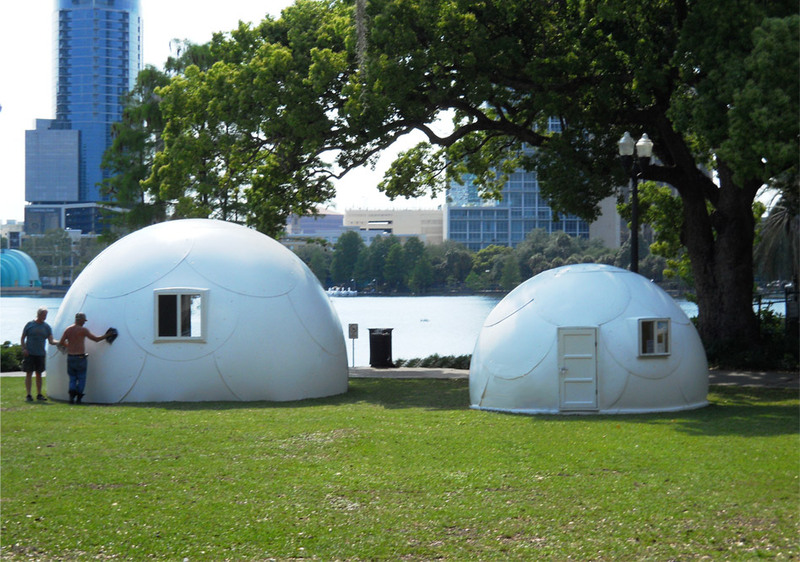 The Intershelter Dome comes in two sizes: 14′ with a 9′ high ceiling and 20′ with a 12′ high ceiling. 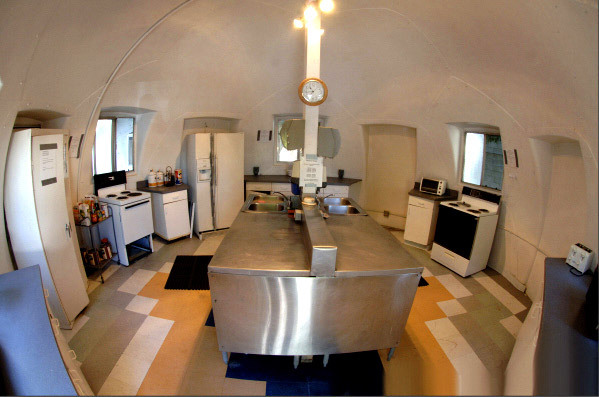 The 20′ Dome contains: 312 SF with 500 SF possible with Loft. 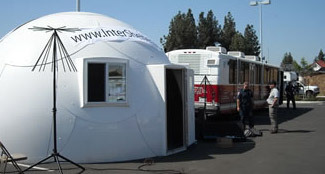 The Intershelter Dome comes standard with 1 heavy duty door w/lock and 2 insulated sliding glass windows. Heavy duty storm resistant or bear proof windows are also available. Due to customer demand we have put together a series of foundation designs and innovative interior layouts which are available on their site. Intershelter also provides consulting and mobile installation services. 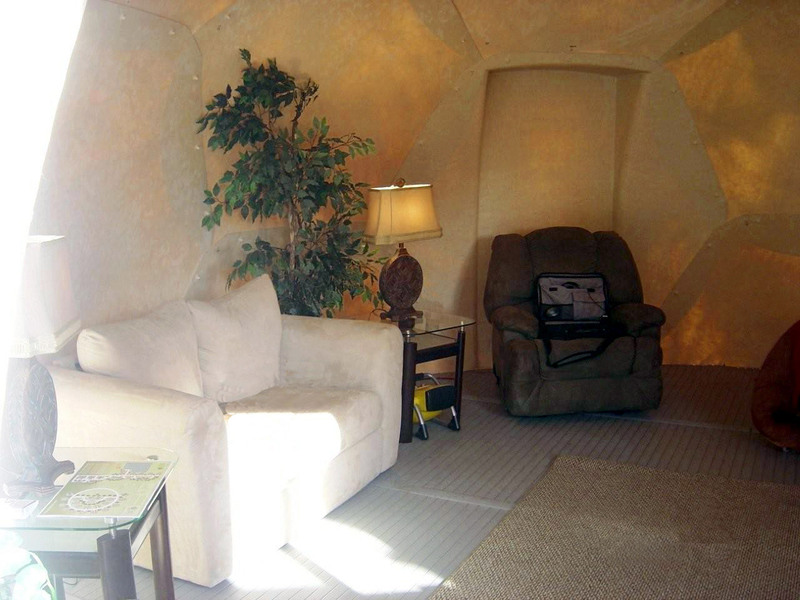 FACTORY DIRECT PRICES START AT JUST $7,500 FOR THE 14′ DOME & ONLY $12,500 FOR THE 20′ DOME! Email us for more info and any questions you may have!!! At PREP CONSULTANTS, we want to help, email us and we’ll give you a special DISCOUNT code!